Ascending Butterfly: Wordless Wednesday: Are Your Excuses More Important Than Your Dreams? 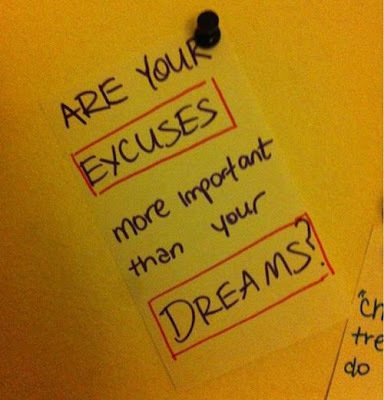 Wordless Wednesday: Are Your Excuses More Important Than Your Dreams? Happy Wordless Wednesday Butterflies - Bloggers feel free to post the link to your photos as a comment (we are too casual for a formal linky widget around here) and we will visit your site and show you some Wordless Wednesday comment love! Your dreams are the fuel that takes you were you want and need to be!! Excuses just are way to deal with the fear of sucess never let your excuses overpower your dreams! @Big Happy Buddha - I totally agree with you! We sometimes let fear/excuses talk us out of following our bliss! I pursued all of my dreams and have actually managed to reach all of my goals so I feel blessed that I had the determination to get this far. I suppose my next goal is retirement (for my husband, I'm a stay at home mom so I'm basically already retired).